“Cabaret” is a sick, twisted joke of the bait-and-switch variety. The Master of Ceremonies welcomes you into the KitKat Club with a smile on his face and an invitation to leave your troubles behind. 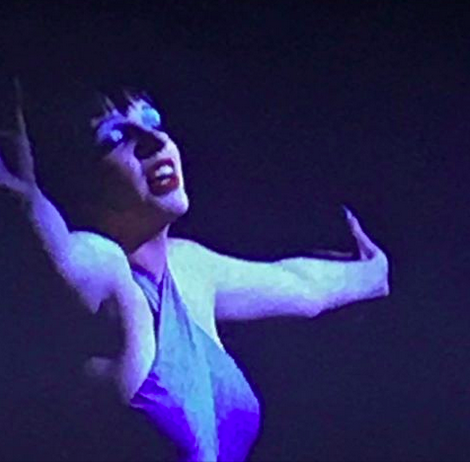 In this way, the cabaret is initially presented as a reprieve from life’s difficulties of life – and yet the movie quickly lets us know that this sense of escape is actually a carefully constructed deception as each song and musical act very intentionally reflects the unfolding events of the movie. But it does so with a smile. It dresses the themes and motifs in burlesque costumes, sight gags and bawdy musical numbers. It makes you feel just safe enough to smile and sing along. It makes you feel like you’re in on the joke when, in reality, the joke is on you because the evils of the world – and your own psyche – have not been left behind at all. They’re simply hiding in plain sight. Like the Nazis at the KitKat Club. While you’re tapping your toes and humming along and leering at girls, it’s there. And it’s growing in power because you’ve been seduced into burying your head in the sand. In a lot of ways, this is edgy filmmaking. “Cabaret” is like a feature-length video essay on human complicity. Though Sally Bowles is an entirely apolitical character, her compulsive narcissism and damn near aggressive refusal to engage with the emotional truth of life becomes a deeply unsettling testament to the kind of inert numbness that allows crimes of humanity to happen. I usually fault movies that fail to make their intended subject matter the actual dramatic engine of the story, but in “Cabaret,” it works. It works that the Nazis are relegated to the sidelines, it works that we’re primarily busy with ménage-a-tois and unplanned pregnancies while the only two Jewish characters struggle in the periphery of the movie. Because those flamboyant plot elements are the dramatic version of the Cabaret itself – they are the distraction, they are the willing disengagement from what’s going on beneath the surface, they are the song-and-dance that grabs our attention while horrors mount behind the scenes. The Master of Ceremonies is the lower self in all of us making it safe and comfortable to sidestep responsibility for our own higher selves and for our fellow man. WordPress Theme built by Shufflehound. Copyright Jamie Stein 2018.